Congratulations to the winners of the 2018 NYCO Youth Concerto Competition (in alphabetic order). They will perform with the orchestra on December 8. 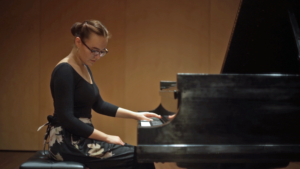 Ukrainian-Canadian pianist Mariya Orlenko is the recipient of The Ihnatowycz Emerging Artist Scholarship at the Glenn Gould School, where she studies under the tutelage of John Perry and David Louie. Mariya received first prizes in the Canadian Music Competition and the Virginia Waring International Piano Competition. She has performed with several orchestras in North America, including the Orchestre Symphonique de Quebec, Virginia Waring Festival Orchestra, and Gulf Coast Symphony. Mariya was the recipient of the Royal Conservatory Gold Medals in 2013 and 2017. She performed a recital as a part of the COC Free Concert Series in 2017. Mariya was a keyboardist in the Royal Conservatory Orchestra. 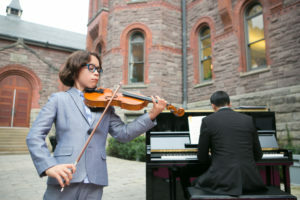 10-year-old Emrik Revermann began studying the violin at the age of 3 ½ at the Royal Conservatory of Music in Toronto. He was recently named one of CBC’s “30 Hot Canadian Classical Musicians Under 30” – the youngest person on the list. He made his solo orchestral debut at the age of 9 with the Canadian Sinfonietta in Toronto. In May 2018, he was named “Absolute Laureate” at the Kocian International Violin Competition in the Czech Republic, after coming in 1st place in his age category. In June 2017, Emrik won a Grand Prize at the Canadian Music Competition for achieving the highest mark in the 7-10 age group, across all instrumental categories. He also won the Canadian Music Competition in 2016, and received the highest mark of all string players of any age. He has won numerous prizes at local Toronto music competitions and festivals. For the past 3 summers, Emrik has studied violin at the Summer Academy at the Mozarteum University in Salzburg, Austria with esteemed pedagogues such as Christian Altenburger, Ernst Kovacic, Paul Roczek, and Zakhar Bron.Emrik is currently studying with Conrad Chow at the Phil and Eli Taylor Academy at the Royal Conservatory of Music. When he is not playing the violin or going to school, he loves playing soccer and tennis. He is thrilled to be performing Zigeunerweisen with the North York Concert Orchestra! Peter Wiley, Mark Kosower, and Danjulo Ishizaka. He currently attends the Glenn Gould School where he studies with Andrés Díaz and Hans Jørgen Jensen as the recipient of the Temerty Foundation scholarship. 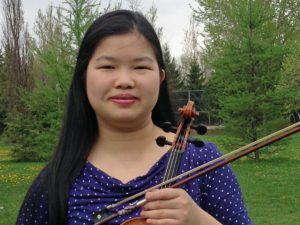 A talented and passionate violinist, twenty-year-old Yu Kai Sun has won first prizes at the Canadian Music Competition, the Festival de Musique Classique Pierre-de-Saurel and the Classival Salaberry-de-Valleyfield. In the 2018 estival season, she was selected to be part of the Schleswig-Holstein Musik Festival in Germany for an intensive 7-week orchestra training festival, in which she was concertmaster for two complete programs. She was also chosen to represent the SHMF at the Tanglewood Music Festival, performing with the Boston Symphony Orchestra in Leonard Bernstein’s Centennial Celebration.During the school year 2018-19, Yu Kai will have her solo debut in the Greater Toronto Area. As a winner of multiple orchestras’ concerto competition, she will perform with the Oakville Chamber Orchestra, the North York Concert Orchestra and the Mississauga Symphony Orchestra. She will also collaborate with the York Symphony Orchestra. Yu Kai has appeared as a soloist numerous times in the past years. In 2015, she performed the first movement of the Tchaikovsky Violin Concerto with the Vancouver Metropolitan Orchestra. In Montreal, she also played the Tchaikovsky, Paganini and Mendelssohn Concertos with her high school’s FACE Symphony Orchestra. During summer, she has attended many festivals, including Banff Centre, Domaine Forget, Orford Musique, Hotchkiss Summer Portals Chamber Music Program, Camp musical des Laurentides and InterHarmony Sulzbach-Rosenberg International Music Festival, studying with Bill van der Sloot, Vadim Repin, Ida Kavafian, Elizabeth Wallfisch, Philippe Graffin, Yehonatan Berick, Axel Strauss, David Gillham, Jonathan Crow, Andrew Wan, among others. 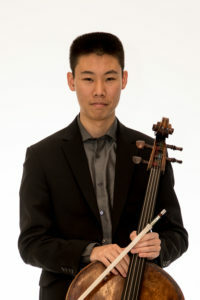 An avid musician in the orchestra, Yu Kai has been concertmaster of the Schleswig-Holstein Festival Orchestra, the Royal Conservatory Orchestra at the Glenn Gould School, the String Orchestra at the Conservatoire of Montreal and of the FACE Symphony Orchestra. A native of China, Yu Kai Sun discovered the violin at the age of 8. From 2013 to 2017, she studied at the Conservatoire de musique de Montréal with Helmut Lipsky. At the age of 18, she obtained the Specialized Studies Diploma. She is currently a third-year undergrad student in the studio of Professor Victor Danchenko at the prestigious Glenn Gould School of the Royal Conservatory of Music in Toronto, where she receives the Henry Hung Foundation Scholarships for her studies in Bachelor of Music (Honours). During leisure time, Yu Kai enjoys cooking, biking, swimming and listening to different genres of music. She is also a fan of traveling and discovering beautiful places. She performs on a modern “Rigoletto” (2008) violin by Isabelle Wilbaux with a bow by Emmanuel Bégin, both graciously on loan by the Fondation des Jeunesses Musicales du Canada for a period of four years.